I have two all time favourite flowers, orchids are grown inside my home and fuchsias grow outside in my garden and many of the tender ones are over wintered in my greenhouse. It has taken me a long time to finally digitise one of these beautiful flowers, the phalaenopsis orchid. 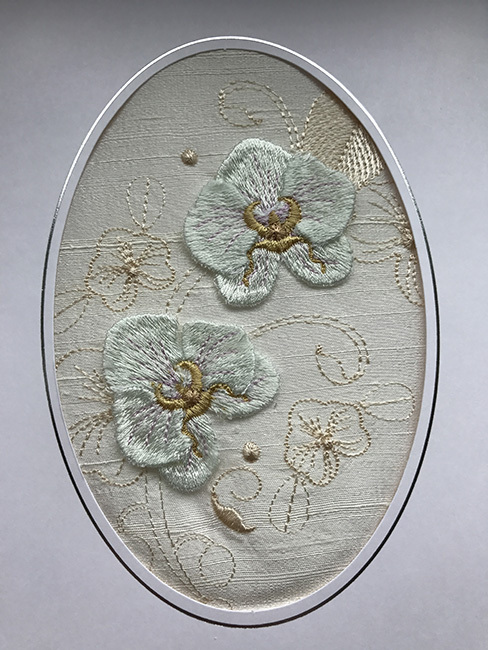 Earlier this year I tested out the orchids by creating an embroidered card for my sister who also loves orchids. 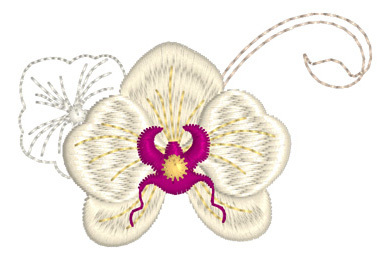 To make them more realistic there is an option for the sepals and petals to be stitched out and added as applique held in place by the column, lip and throat of the orchid. You only have to browse in your local nursery to see all the different varieties and colours of orchids that are available. 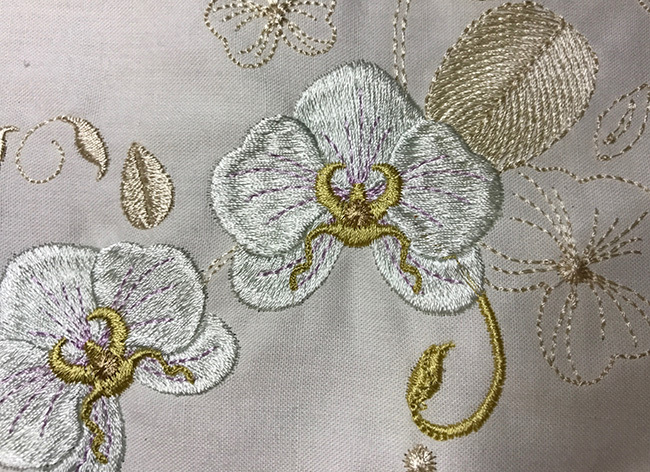 I have named my collection Orchids for Ruth and although the centres were initially a pale gold, I have chosen a deep pink, Sulky Rayon 1191 Dark rose for the finished designs. To enhance the beauty of the designs I have captured their silhouettes as a background. Firstly the background is stitched out in pale colours. My appliques were stitched out on polyester organza with Sulky Soft ‘n Sheer stabiliser. I prefer this method rather than wash away as the organza holds the stitches giving enough support and would need trimming anyway. I carefully trimmed around the petals and sepals applying a little Fray check where the stitches appeared to have been cut by mistake. Compare the designs without the option of appliques and you can see it is worth perfecting this method. It has been so fun creating the designs for this collection, which will have 5 sets all in all. Here is a little taste of what is to come including dragonflies. 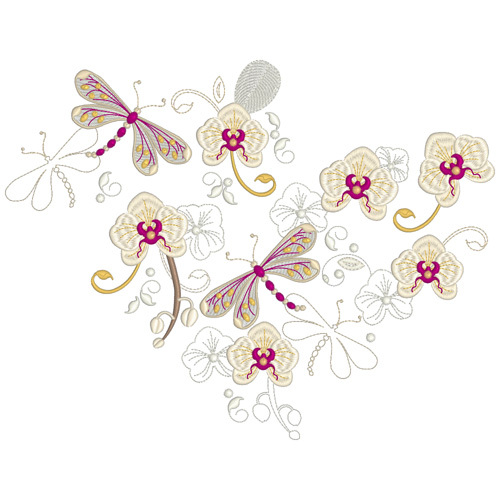 I am taking the elements of the orchids and dragonflies to make complimentary borders, corners and panels, as well as the possibility of bamboo frames. Let’s see how it goes. The first set for 4″ x 4″ hoops will be released this week and there is a freebie to download and test out. Watch out for the other designs in this collection which will include some exciting features. By the way I have to confess that I am not as yet happy with my results at digitising fuchsias so far but I have made several attempts, and hope I will soon be able to perfectly digitise some unique designs which show off their elegance and grace. 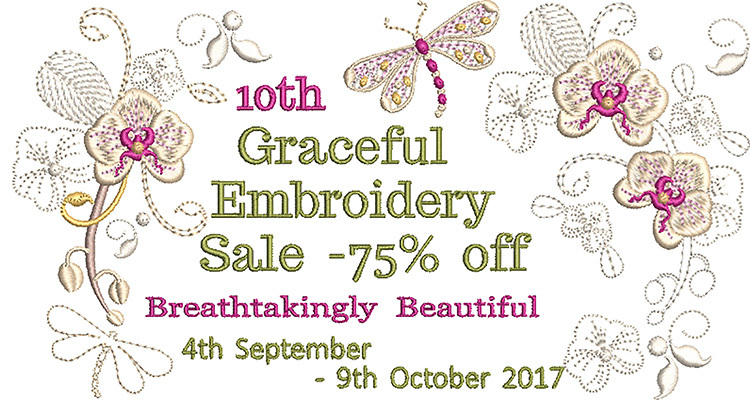 Lastly can I tell you that we are only just over two weeks away from the 10th Graceful Embroidery Event which includes much more than just a great sale. Join my Embroidery group to make sure that you do not miss out on the daily downloads and all the fun. 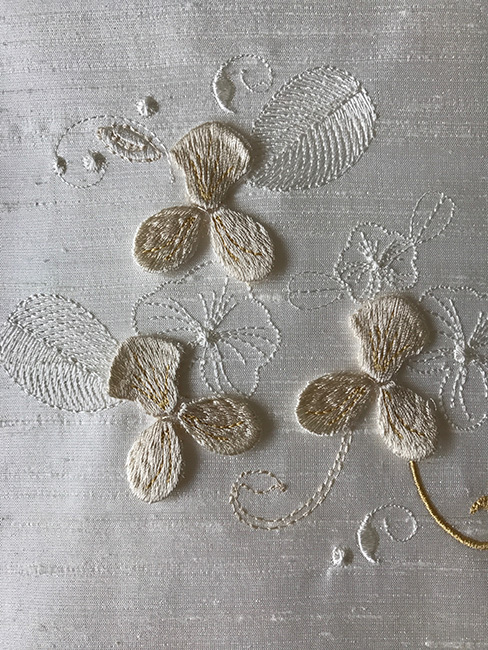 This entry was posted in Discussing machine embroidery, New Designs and tagged 3 Dimensional embroidery, Digitising flowers accurately, machine embroidery, Making embroidered cards, The importance of colour. Bookmark the permalink. Love your orchids. Just came in from sitting in my garden, watching the hummers fight over control of the feeders and the grape jelly loving oriole come and bring their babies for grape jelly. Looking forward to being able to capture flowers, especially orchids to feed my gardening habit in the dead of winter. Your designs are just beautiful. It makes me almost look forward to being inside on a snow day in the dead of winter in NIagara Falls, NY, embroidering all day. 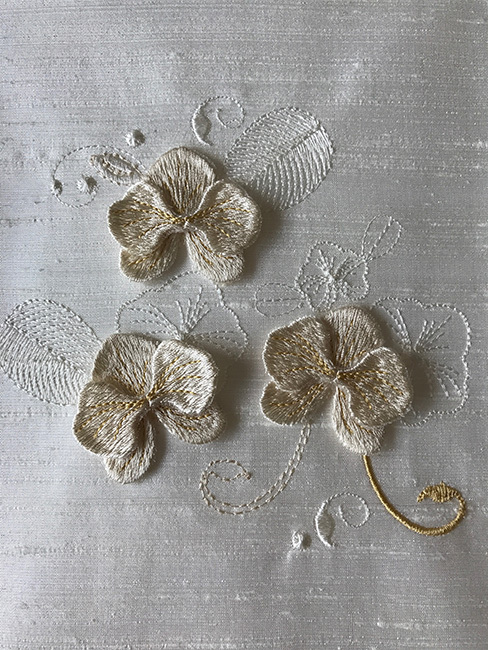 Thank you for some of the most beautiful & realistic flowers for embroidery. Can’t wait to see the rest of the sets. Hazel, just a thought, could you have used temporary adhesive to hold the appliques in place before doing the final stitch down? Having said your suggestion would not work I have just tested it out. 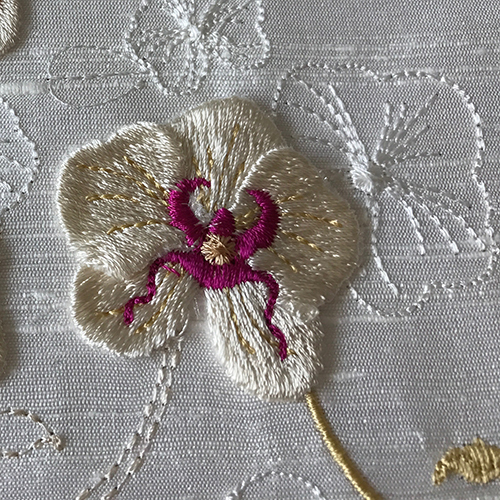 I stitched the sepals and petals together on the back with a few hand stitches and laid the prepared orchids on some old stitch and tear and gave them a good dose of temporary adhesive. They worked perfectly without needing any adjustment. Well done. I will give you $20 of Rewards on your account for making the best suggestion this week. Thank you so very much.